President, Pant Consulting Pte. 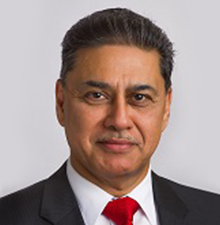 Ltd.
Pradeep Pant is a highly experienced senior business leader, now involved in business consulting and education. Pradeep was Executive Vice President and President of Asia Pacific and Eastern Europe, Middle East and Africa (EEMEA) for Mondelēz International until end 2013. Pradeep has served as President, Asia Pacific, since 2008 and he assumed his responsibility for the EEMEA region in 2012. With over 37 years of experience in the FMCG industry, Pradeep is an expert in building businesses in both mature and emerging markets. He has managed a wide range of iconic brands across some of the world’s fastest-growing, complex emerging markets including China, India, Russia, Turkey, and Southeast Asia as well as developed markets of Europe and Japan. Pradeep was also the Regional Managing Director for Asia, Africa, and the Middle East for Fonterra Brands. He was a member of the Fonterra leadership team. Before Fonterra, he spent 19 years with The Gillette Company, working in India, Russia, Turkey and Asia Pacific. Pradeep has also worked with Nestle, J Walter Thompson, and the Tata group. Pradeep holds a Master of Management Studies degree from the Jamnalal Bajaj Institute of Management Studies, Bombay University, and a BA (Honours) in Economics from Shri Ram College of Commerce, Delhi University. Pradeep is also the Founding President of Food Industry Asia (FIA), an advisory board Member of SMU's Lee Kong Chian School of Business and a senior advisor to Hay Group.